Our goal for this weekend was to have a relaxed fall foliage weekend (with a little hiking of course) and we also wanted to camp out on Saturday night, We were meeting my son for lunch in Long Lake on Saturday, so we planned the weekend around that. We haven't explored too much in that area before, so there was lots of fair game. We weren't meeting for lunch until 1:30, so we had some morning time to explore. We took County Route 10 (Sabattis Road) west until we got to the gate blocking an old jeep road that heads north to Round Lake. The lake has a dozen or so designated campsites and sites 7-9 on the west side are accessible from the old jeep road (now unmarked "herd" path). In the back of my head, I thought that if any of these sites were available, we could come back later to camp. We sent to sites 9 and then 8 and both were available. We thought 9 was nicer, and it was also closer. It was only 1.5 miles from Sabattis Road. The walk was easy except for one spot where beavers had built a dam and you had to walk on the beaver dam to cross and get back to the jeep road. Having found this spot, we knew we had a good option for a campsite. We went back to the car and back to town for lunch. After a nice lunch at the Adirondack Hotel in Long Lake, we went to check out my primary objective, Lake Lila. I've always heard great things about Lake Lila, but had never been there. I knew it would probably be too busy to camp at, but we got out there at 4 PM to check it out. Lake Lila has an access road off of Sabattis Road that is a 6 mile gravel road. The speed limit is 15 mph, and that's about the speed you can go on the road. It's passable with a regular car. We got to the parking lot at the end of the road and the lot was essentially full. We managed to get a parking spot, but cars were starting to line the road near the parking lot. Since the lot was full and it was getting late, we didn't even attempt to camp there. We just walked the .3 mile canoe carry trail to the edge of the lake. Both campsites near the carry trail were taken. It was a beautiful night and the lake looked really pretty. 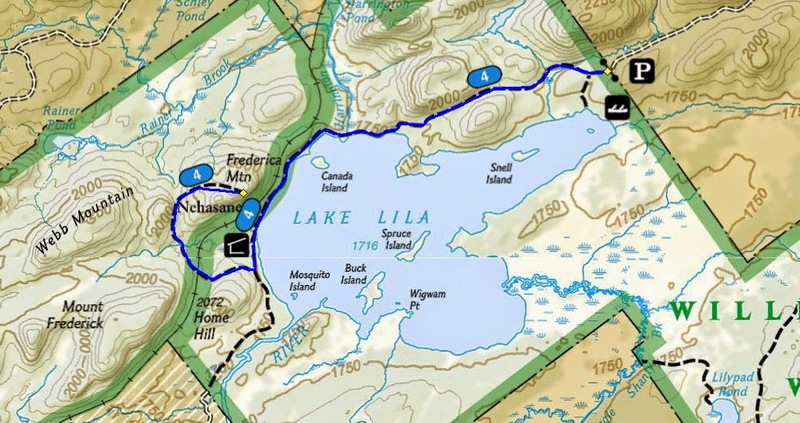 We decided to go back to Round Lake to camp, but come back to Lake Lila on Sunday to hike to Mount Frederica. Once again we parked off the shoulder of Sabattis Road and hiked back into Round Lake. Campsite 9 was still available, so we set up camp just before dark. We had a nice campfire and were in the tent by 9 PM. Sunday morning we woke up to heavy fog. There was no morning sunshine at the lake. It was pea soup, but fun none the less. After a short morning fire, we packed out and headed back to Lake Lila. We had 4.5 miles to Mt, Frederica. At 9 AM we were on the trail (jeep road) that goes along the north side of the lake. The road would not be that exciting to hike on during most of the year, but now during the peak of leaf season, we didn't mind. After 1.5 miles the road got close to the lake so we could view the water. Walking on the road was quick and in 1 hour we had hiked the 3 miles to where the road splits and we followed the right branch to head toward Mt. Frederica. The jeep road to Mt. Frederica hooks around the mountain to avoid the cliffs, then a trail branches off for a final push to the summit. There is a view from the summit, but there is a terrific view on ledges that are easily reached just below the summit. With the leafs at peak color, we were treated to an awesome sight. The collection of pictures below will testify to that. From the summit, we could see the collapsed train depot structure below. On the way down, when we reached the train track crossing, we followed the tracks north to reach the old structure. We followed these tracks north on the way out. From the depot, we followed the tracks a little farther north until we could see Lake Lila on our right. We bushwhacked a couple hundred yards to get back on the trail. Back on the trail, we completed our fall foliage hike by hiking back on the jeep road to the car. We both agreed that we need to come back to Lake Lila sometime without our dog Rev in order to kayak on Lake Lila. It is a beautiful lake. We had a successful trip. The leaves are at peak in the Long Lake/Blue Mountain Lake/Indian Lake area. Our drive home was quite colorful and enjoyable.